When you think about Kannur (a place in northern Kerala, also known as Cannanor), the first few things that comes to your mind will be the authentic thalassery biriyani, theyyam, home of red flag/ Communism, beaches and historical monuments etc. For the outsiders, Kannur is famous for its wide variety of food delicacies like biriyani, pathiri, kalthappam, pazham nirachathu, kannoorappam etc. Kannoorappam (കണ്ണൂരപ്പം) is one of the traditional snack from this city of Looms and Lores. I always remember buying them in packets from the famous “Sheen bakery” near the railway station on my each visit to Kannur. Recently, a friend of mine shared this recipe of kannorappam with me. Tried it instantly and the preparation came out really well. Here I am sharing the same recipe with you all. Try it and let me know your feedback in comments. Wash well and soak 1 cup of raw rice for about 4 hours in water. After 4 hours, blend the rice with some water (1/4 cup) into a thick paste in a mixer. Add cooked rice to the batter and blend it again. Add maida, sugar, few cardamoms and blend it once more. The final batter should be of a coarse texture, semi thick (not be too thin nor too thick) with dropping consistency. Transfer it to a bowl, add a pinch of baking soda and keep it aside for 8 hours. After 8 hours, heat the paniyaram pan / unniyappachatti with some oil / ghee in each hole and fill 3/4th of the hole with prepared batter. Cook in low-medium flame until small holes appears on top (before it turns golden brown color). Now flip the appam using the spatula or spoon and cook the other side until the sides turn golden brown. Check by inserting a toothpick in the center and it should come out clean, with no raw batter sticking to it. Transfer to a bowl with a kitchen paper towel, prepare more kannorappam with the remaining batter and enjoy them hot. With the amount of ingredients mentioned in this post, I prepared around 18 kannoorappams. You can adjust the volume of ingredients as per your needs. Kannoorappam is usually dual tone in color. The top portion is white and the bottom is golden brown. So in step 7, flip the appam upside down before it turns golden brown. 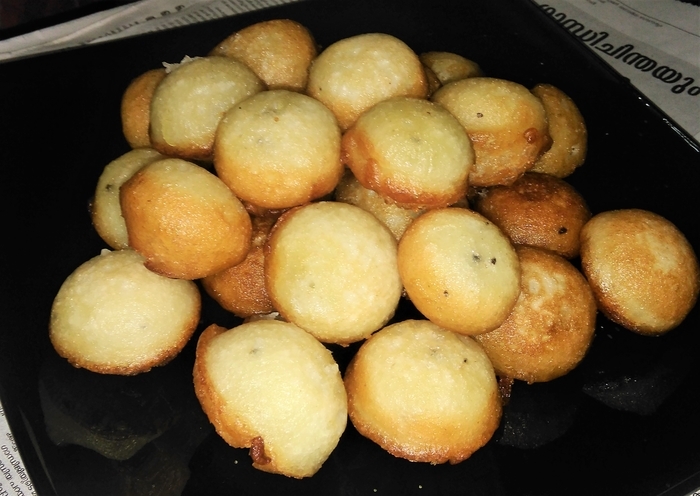 This entry was added on October 3rd, 2018 by Jameela Beevi in Bakery and tagged with make unniyappam, unniyappam kerala style, malabar food fest, Panchara Neyyappam, kannoorappam, kannur recipes, easy unniyappam, Pancharayappam, malabar recipes. Last revised on October 3rd, 2018.